Increase your vehicle visibility, and reduce accidents and rooftop damage to your truck by easily installing our MMP-F150-2017 lightweight third brake mounting plate. 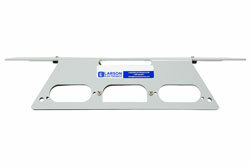 The rooftop mounting plate requires absolutely no drilling to install while supporting lights of up to 30 lbs. This mounting bracket attaches to the third brake light OEM location making it the perfect choice for the Ford F-150 non-magnetized aluminum body. This MMP-F150-2017 features an aluminum bracket with a 24" by 8" magnetic steel mounting surface. The lightweight aluminum mounting plate is compatible with the 2017 Ford F-150 aluminum body pickup trucks, offering operators and fleet vehicles a convenient mounting location for any magnetic light, equipment or application weighing up to 30 lbs. The MMP-F150-2017 is constructed in Texas from a durable aluminum frame with aluminum brackets and steel for the mounting plate surface. This mounting plate is especially designed for the 2017 Ford F-150 aluminum body pickup trucks. 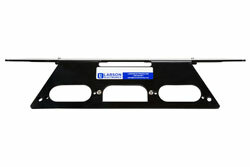 The lightweight aluminum plate offers operators a sturdy and reliable platform to deploy magnetic mounted lights or equipment of any type (requires magnetic base on equipment), up to 30 lbs., on the top of their truck for optimal performance. The MMP-F150-2017 is installed via the rear cab lights, has a weatherproof seal on the back side for a secure and dry installation that helps protect against scratches to the body of the truck. The mounting plate requires absolutely no drilling for installation, and the CNC manufacturing process provides perfect fitment like OEM products. The aerodynamic design of the MMP-F150-2017 is engineered to support wind-loads seen at highway speeds. This rooftop mount is powder coated for added durability, car-wash safe, and offered in a black, white, or grey finish. 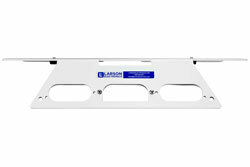 The MMP series of vehicle mounting plates from Larson Electronics features an aluminum bracket and a steel top plate that is bolted onto the aluminum bracket. The aluminum bracket is mounted to the truck using the 3rd brake light to secure it to the vehicle. The steel plate is bolted to the top of the aluminum bracket. 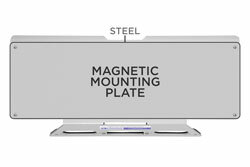 This steel plate allows for mounting equipment with magnetic bases to the steel plate. Magnets require a ferrous metal for the magnet to "stick" to the surface. 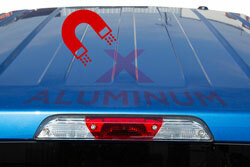 Aluminum is a non-ferrous metal so a magnet will not pull or be "attracted" to the aluminum. The steel top plate is a ferrous metal, and a magnet will be "attracted" to this plate, pulling the equipment to the steel. This does not make the entire truck magnetic. 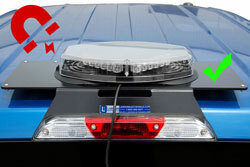 This does allow for mounting equipment with built-in magnets to be secured to the vehicle. In the case of late model Ford trucks, the body is made out of aluminum, preventing the use of magnetically mounting equipment to the truck without the use of this mounting bracket. Features: Absolutely NO drilling to install, functional for fleet vehicles, attaches to third brake light OEM location, weatherproof gasket, car-wash safe, lightweight aluminum structure with steel magnetic mounting surface, powder coated, comes in different colors, supports up to a 30 lb. 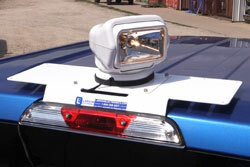 magnetic light or structure, and safe for highway speeds. The MMP-F150-2017 eliminates damage to your truck caused by rust, scratches, exposed wires, leaks, drilling holes and doesn`t lower the resell value of your vehicle. 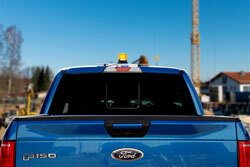 The NO drill feature is great for leased trucks, eliminating rooftop damage with penalties associated with making modifications to the vehicle. 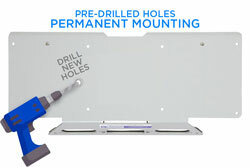 This rooftop plate does not require any drilling to install; however, if desired to install this mount for other intended uses, it can be drilled for different mounting purposes. Installation: The MMP-F150-2017 is easy to install and requires absolutely NO drilling. This mounting plate installs through the 3rd brake light on 2017 Ford F150 pickup trucks, between the body of the truck cab and the light. 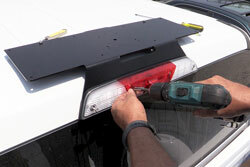 Operators simply remove their 3rd brake light, position the pre-cut mounting bracket and reinstall the light through the bracket with new mounting hardware included with purchase. Wiring can be ran into the cab of the truck by cutting a slit on the bottom side the gasket and inserting cable into the cab. 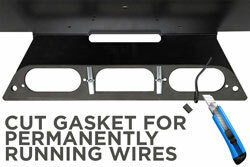 The installation kit includes two toggle bolts and longer mounting bolts for the 3rd brake light. 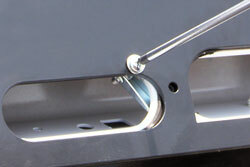 The toggle bolts are required to secure the mount to the vehicle body. The longer bolts are intended to replace the factory installed mounting bolts to account for the addition of the mounting bracket and gasket that is being installed between the cab and the light. When installed properly, there is no vibration or rattling of the mount when the vehicle is in use. The toggle bolts support the extra weight and secure the mount to the vehicle. The aerodynamic design of the front of the mount prevents any associated whistling or added road noise that may be seen with other mounting brackets.